Jim Bach: Recent speculator activity indicates that for August silver prices, it may get worse before it gets better – but it will get better. Commodities analysts like Money Morning‘s Resources Specialist PeterKrauth expect this to be the month silver rebounds from its disappointing July, where the white metal lost 3% following its uncharacteristically bullish June. Short futures contracts are used as a bet against the price of silver, as traders holding these contracts will profit when the price falls. 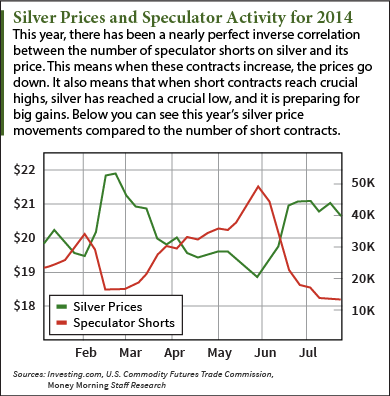 On the year, silver speculators and their volume of short contracts have had an almost perfect inverse correlation. As the accompanying chart shows, every time short futures contracts increased, prices fell. However, large shorting tends to work as a “contrarian indicator,” Krauth said. As shorting peaks, traders sell for short-term gains, and the price rises. That’s why the short sellers who follow the crowd and buy when shorting is high miss all the gains. This pattern was evident just a couple of months ago. This past June’s six-week rally came on the heels of increased speculator activity. Beginning on May 20, silver shorting began to hit record highs at 38,075 contracts. That number rose over the next two weeks before topping out at close to 49,000. At this time, silver was trading at yearly lows below $19. And sure enough, speculators saw these lows and began liquidating their shorts, buying long as silver flourished. Over the next six weeks silver gained 14.7% and was trading at $21.50 just before mid-July. Compare this to the weeks following February 2013’s notably low short volume, when speculators held only 4,913 of these contracts. While silver was trading at $31.82, over the next month it fell 21.2% and continued to decline. By mid-April it had absorbed 28.8% in losses, and the year ended up being punishing for silver prices. Speculator activity ebbed and flowed, and prices moved with a relatively strong negative correlation on the year. So what’s the speculator activity telling us now? As of the U.S. Commodity Futures Trading Commission’s most recent Commitment of Traders report, speculators have out 18,093 short contracts on silver. That’s relatively low – the average number of silver short contracts held since 2013 is about 23,500. But this is up about 50% from the week before that, when short contracts hit 12,603 – their lowest on the year and lowest since February 2013. It looks like speculator short positions bottomed out in the last two weeks, and are beginning to mount. That means silver prices are likely to continue to decline like they have over the past week, trading consistently below $20 an ounce for the first time since February. As silver contends with the speculators, and their buildup from yearly lows, Krauth sees “sideways action” for a little while before posting marginal gains by the end of August. Look for silver’s biggest advance to come in the fall.